Linkedin has become the largest interactive community for LIMS users & professionals and the two leading LIMS user groups on Linkedin are LIMS/LI (with over 4,000 members) and the LIMSforum ( with nearly 40,000 members). If you are a LIMS user or professional and are not yet a member of these groups you will want to visit these groups and check out the great discussions below. Some of these discussions have nearly 100 comments by user members! As we near the end of 2012, I thought it would be good to identify the most popular discussions posted so far in 2012. I went through the group I run (LIMSforum) and selected the most popular discussions for this year and I asked Terry Iorns, the group owner of LIMS/LI, to do the same. There is very little overlap in the discussions between the 2 groups so you will want to be sure and visit both groups. The following table provides links to those popular discussions that Terry and I found in each of our groups. These discussions are still open and we invite you to jump into those discussions or start your own. The members in these groups are friendly and very helpful and welcome the chance to answer questions from end users. Don’t be shy, all questions and comments are warmly welcomed. Click on the discussion you are interested in to read the entire posting! 1 Will Cloud Computing do to licensed software companies what the internet did to magazines & newspapers? 3 Does anyone use a Serial-to-Ethernet device to interface lab software to serial instruments? 5 In the environmental analytical contract lab industry, are value-added services becoming “the norm” and part of clients’ expectations? 7 When a vendor releases is new version of their software and the data model is fundamentally changed, should this be classified as an UPGRADE, MIGRATE or NEW SYSTEM? What is our experience and opinion? 8 Would you want to “Test Drive” lab informatics software before you buy it? 9 Does anybody know if it is possible to run LIMS in virtual machine VMware media? 10 What is the best LIMS for next-generation genomics/Sequencing samples? 13 Has anyone integrated a LIMS and a Manufacturing Execution System (MES)? 14 What keeps you from getting a LIMS for your lab? 16 It’s time to run Java out of town, are LIMS built on Java the next to go? 17 Is there any use or need for a Wiki in the laboratory? 18 Hi, did anyone use a LIMS for sequencing core facility? I am now testing Gnomex wich is open source and designed for highthrouput sequencing platform. That looks to give us satisfaction. 20 Are there any good work group collaboration tools that can be an alternative to a LIMS? 22 Which type of software license is of best value? 23 Does Open Source have some advantages when it comes to validation? 24 What is the most important trend for Lab Informatics Software? 25 Consumerization of IT, will this be a trend for Laboratory Informatics? 27 Does “Big Data” apply to Lab Informatics in ways other than Next Generation Sequencing (NGS)? 28 Hi Group, I was wondering if anyone has some advice or recommendations for a stand alone Blood Banking application. 29 What do you use for Data Mining, especially in drug discovery ? 31 Is there a list of LIMS, ERP or SDMS solution that are based (or at least able to manage) chemical structures? 32 How do you use laboratory informatics tools / processes to support lean concepts in your lab? How do you use laboratory informatics tools / processes to support lean concepts in your lab? 33 Are LIMS and LIS the same thing? 34 When defining your lab’s informatics requirements, what are the key points to cover? 35 NGS LIMS – Do you have any recommendations for NGS LIMS? 37 The DiY LIMS… Does this Dilbert cartoon remind you of anything? 38 Web Browser based apps have been the trend for about 10 years now. What is next? 39 Switching from a paper lab notebook – help and suggestions needed. 40 Which direction will we see with lab informatics apps? 41 Do it Yourself (DiY) LIMS. Is it right for your lab? Are you a software developer or a lab? 43 Anyone have any experience with good document management software to help with CAP/CLIA inspections? I’ve heard good things about Genial (Geneial) – anyone else? 44 I had some questions regarding LIMS pricing 1) Typically are user licenses & server renewed on an annual basis? I read through the 2012 buying guide and I wasn’t clear on this. Thanks! 46 hi all , is it necessary to have our LIMS software validated by the FDA to sold and install it in the US ? 47 Is there a reason for a lack of innovation in the LIMS industry? 48 Are serial port based instruments still common in the lab? 49 If you had to pick one mobile device, which would you choose? 50 Will these tech trends have a positive affect on your lab? 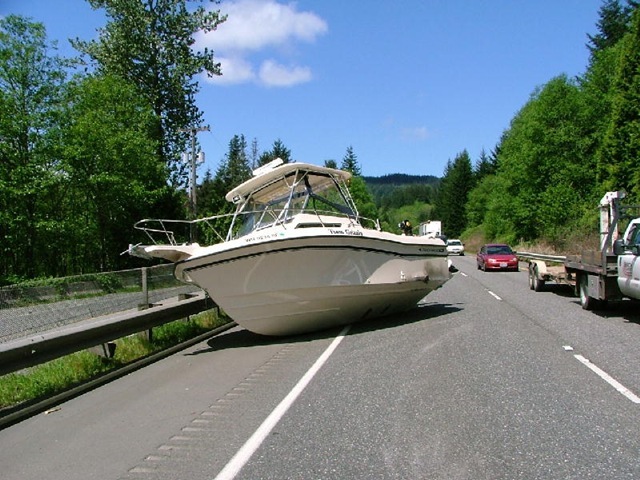 It’s like a fish out of water or in this case, a boat in the road. I have been doing some research on the different types of Open Source licenses. The following is a good posting that quickly summarizes the potential dangers of Open Source to corporations. You just have to know the rules but as with all software, you need to live by the license agreement. The funny thing is that GPL touts “freedom” but it is a rather restricted “freedom”. it has all the ring of truth of the double speak/thought from the book 1984 by George Orwell. Now I am all for Open Source in the corporate environment but you have to be careful, especially beware of AGPLv3. Clouds are rapidly becoming an important platform for scientiﬁc applications. In this paper we describe our experiences running a scientiﬁc workﬂow application in the cloud. Management System. The clouds used include several sites within the FutureGrid, NERSC’s Magellan cloud, and Amazon EC2. We describe how the application was deployed, evaluate its performance executing in diﬀerent clouds (based on Nimbus, Eucalyptus, and EC2), and discuss the challenges of deploying and executing workﬂows in a cloud environment. We also demonstrate how Pegasus was able to support sky computing by executing a single workﬂow across multiple cloud infrastructures simultaneously.